The paper is an analysis of how Tolkien's thought on "fairy-stories" evolved between his 1939 St. Andrews Andrew Lang Lecture "Fairy Stories," through his contribution "On Fairy-Stories" to the 1947 Essays Presented to Charles Williams, and concluding with his 1967 essay on the nature of "Faërie." Time permitting, the paper will also include a discussion on how Tolkien's "Smith of Wooton Major" illustrates his concepts. I would like to write a paper focusing on the renewed interest in popular culture of the fairy tale. There are currently several television programs such as Grimm and Once Upon A Time and a number of movies such as Red Riding Hood, two versions of Snow White, and one in production of Jack the Giant Killer based on traditional fairy tales. I would like to take C. S. Lewis's, J. R. R. Tolkien's, and George McDonald's ideas on the use of the fairy tale and compare them to the same elements found in these postmodern versions of the genre. In many ways, McDonald, Lewis, and Tolkien helped to define the modern use of the fairy tale in the 20th century and thus can be useful tools to analyze and interpret the use of the fairy tale in the 21st. I plan to examine the battle between good and evil, escapism, the use of magical creatures, violence, and using the fairy tale as a means of moral instruction. C.S. Lewis' The Screwtape Letters launched a genre of demonic epistolary fiction. Intriguingly, we have seen Screwtape-style letters about psychotherapy, (anti-) creativity, pedagogy, and scientific research. Evidently, Screwtape continues to be relevant among contemporary writers, but is it relevant to students? 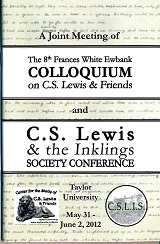 From the results of a spiritual perspective survey and various teaching methods in a secular undergraduate class, and including the analysis of ninety-five student-created Screwtape letters of cultural critique, we see that the genre of demonic epistolary fiction gives space for creative cultural critique and the contentprovides inspiration for that critique -- even for generically spiritual, nonreligious, or anti-theistic students. This content is currently not available for download.